If I had to name ONE element that has the power to make or break a culture of continuous improvement in any organization, I'd say that it would be leadership. Of course, methodology and technology are important components of an improvement culture (more on that here), but leadership is what really drives the culture change. So what does a good leader do to spread continuous improvement? The result of that research is a list of 40 things that leaders should be doing every chance they get. Trust me - it's not as intimidating as it sounds. Each of these behaviors is likely just a small tweak to your current leadership style. But those little adjustments will have a huge impact on your culture of continuous improvement. 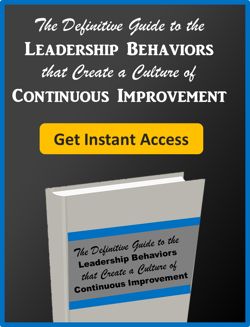 We've pulled all of these behaviors together into a fabulous eBook that will be an invaluable reference point for you and your colleagues as you spread continuous improvement in your organizations. And the best part? It's free for you, our lovely blog readers.